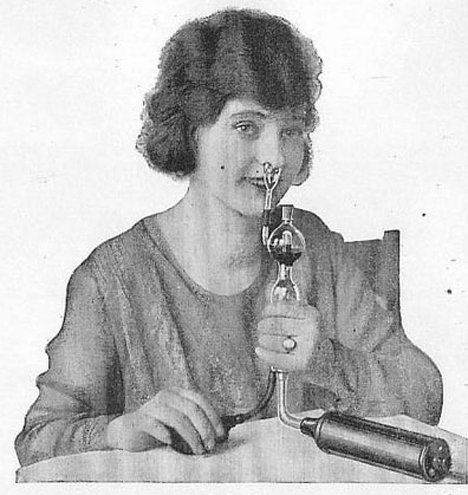 In the early 20th century, medical technology was still pretty primitive and often exceptionally dangerous. But few devices were as widely used as the violet ray, an electrotherapeutic device that was said to treat everything from joint pain to bad skin, poor circulation, stuffy noses, prostate issues, and warts. 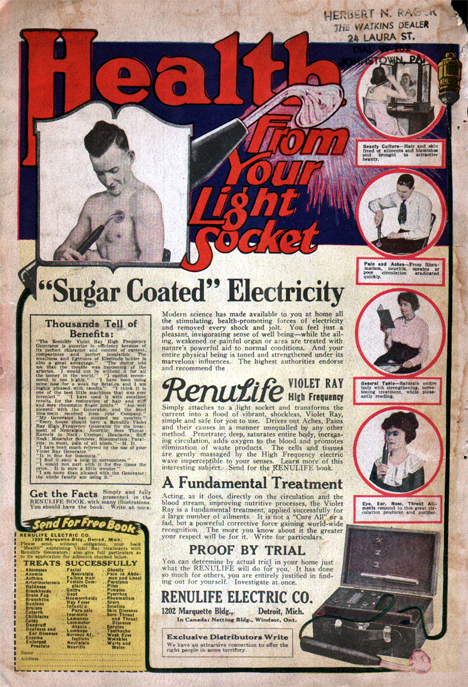 The violet ray machine was more or less a portable Tesla coil that patients could take home to electrify themselves without a doctor’s supervision. Treatment with a violet ray machine involved attaching one of a various set of evacuated glass tubes to a handle, holding it to whatever part of your body was troublesome, and then switching it on. This caused a high voltage, high frequency, low electrical current to run through the body. Similar technology is actually still used today in TENS machines that zap low currents into a targeted area of the body to relieve pain through nerve stimulation, though modern machines are safer and their use is monitored by trained professionals who use them only for specific types of pain. A violet ray machine, on the other hand, was capable of creating a powerful electric arc that could cause serious skin burns. The violet ray machine proved to be a little too popular for its own good. Once manufacturers caught on to how many doctors were prescribing them for various ailments, the devices were suddenly said to cure just about anything. By the mid-20th century, the bizarre marketing claims caught the unwanted attention of the FDA. The machines were recalled and ordered to be destroyed. 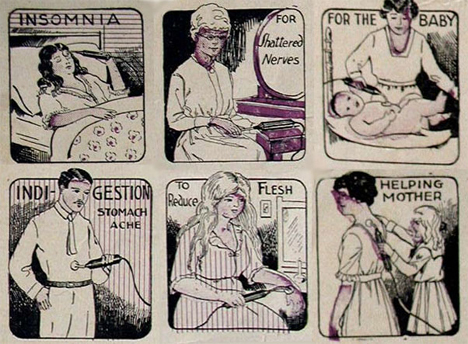 But, as is the case with many “miracle” cures, there are still some firm believers in the good old violet ray. Their manufacture is banned in the US but plenty of companies outside of the States still make them. 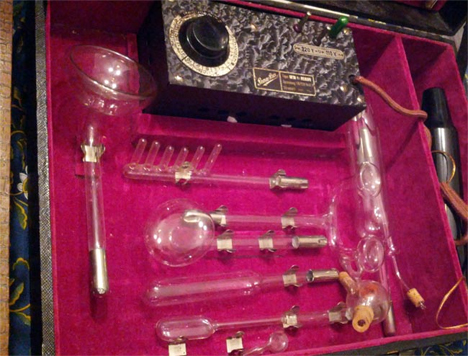 The antique versions are popular with collectors of vintage medical devices. In his day, Edgar Cayce was a big proponent of violet ray treatment and followers of his advice still use the machines today – but they tend to use them for skin oxygenation and stimulation rather than as a miracle cure for the common cold. See more in Antique Gadgets or under Vintage & Retro. December, 2014.